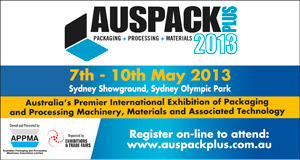 Makum Pty Ltd is pleased to announce we will be exhibiting at Auspack Plus 2013 at the Sydney Showground, Olympic Park. The exhibition runs from May 7 to May 10. We will be exhibiting at stand number 841 and we will have static and operating equipment on display. We will be exhibiting a single lane rotary tub filling and sealing machine, designed and built to fill dried products such as nuts and dried fruits. The display will include a multi head weigh filler mounted on a stand above our MAKUM rotary tub filling and sealing machine. Makum will also have on display a stand alone automatic scroll tub denester, two piston fillers and a reel stock semi automatic heat sealing machine. We look forward to seeing you at our stand during Auspack Plus 2013.